If you are lucky enough to have a tree(s) on your property in Chicago, tree service is something that must be considered. Though a tree can beautify your home, increase property value, and provide shade during the summer, a tree that is neglected can be a detriment rather than an asset. In and around Chicago, tree service can be especially important due to the cold, windy winters and the snow and ice they bring with them. A healthy, well-maintained tree can do wonders for a property, and keeping them in the best shape possible is well worth the time, effort, and money. If left unattended, on the other hand, trees may not become merely unattractive, they can actually cause damage to property or even people! Tree service in Chicago can take on many forms. Treatment and protection from insects and disease are two very important aspects of tree service. Chicago residents should regularly inspect their trees for fungus, discoloration, and other visually noticeable ailments. 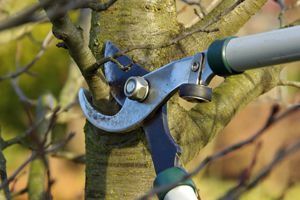 These visual inspections can often identify a problem that if left unattended could result in tree removal (you can also get a professional to come and inspect your trees for you, generally at a very reasonable price). For certain species of trees, preventative treatments like an annual insect or fungicide spray may be a good idea. Sometimes you simply catch a disease, insect, or fungus problem too late; other times a particularly bad storm or heavy impact may leave a tree in too precarious a position to be safe. In these instances, tree removal may be your only resort. While some tree service in Chicago might be safely done by the homeowner him or herself, tree removal should generally be handled by a professional. It is important to communicate with your contractor when tree removal is necessary; the price you agree upon might not include things like stump removal, so it's a good idea to know for sure exactly what you will be paying for when comparing quotes from different companies. One of the most common reasons to call for tree service in Chicago is trimming. A properly trimmed tree will not only look good, but will also pose less of a threat to your property during a strong storm or under the heavy weight of clinging ice and snow. Large branches that hang over your house or those that are close to power lines can be particularly tricky to remove; once again, calling in a pro is highly recommended to avoid damage to people or property. Obviously, Chicago tree service is likely to vary in price depending on the nature and size of the job. We've seen Windy City trees trimmed for as little as $300, but we've also seen larger jobs like tree removal go as high as $2,000! For stump removal alone, Chicago area prices range from $300 to $500. When it comes to hiring a professional to treat and protect your trees from insects, fungus, or disease, expect to pay a few hundred dollars. If you'd like to learn more, here's a great resource on tree removal prices from TreeRemoval.com. Comment: I have a half dead tree in my back yard that I want to have removed. Comment: Neighbors tree branches hanging in my yard. Chicago Tree Services are rated 4.71 out of 5 based on 1,725 reviews of 42 pros. Not Looking for Tree Service Contractors in Chicago, IL?